When the Minnesota Lynx took on the Washington Mystics in a preseason game at Mayo Civic Center in Rochester, the event had Mayo Clinic written all over it — including on the jerseys of the reigning WNBA champions. Mayo is the marquee sponsor of the Lynx, and putting Mayo's name on a team uniform was a first. "It pushed us a bit out of our comfort zone," Mayo President and CEO John Noseworthy, M.D., said at a reception before the game. "But it has been great. 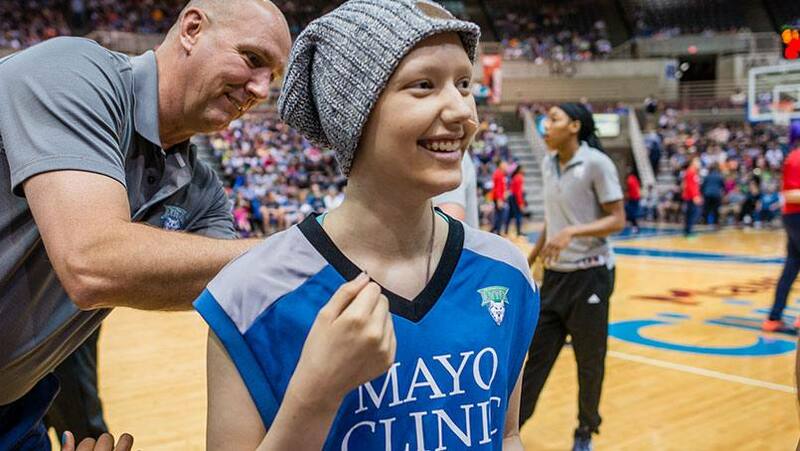 It's something very special to come to a Lynx game and see so many families with young kids, especially young girls, wearing Mayo Clinic jerseys." This game was especially special for four young girls in the arena. That's because they'd been selected as the game's "Kids Captains." According to the Rochester Post-Bulletin, the honorary title "conferred all kinds of privileges, including courtside seats, a meet with the team captains at center court, and $50 concessionaire check." (That's what Cory calls a golden ticket.) Three of the girls who were chosen are part of Sports Mentorship Academy, a group that Mayo Clinic supports through its community engagement efforts. The fourth, 15-year-old Sara Carriere, is a Mayo patient undergoing treatment for Ewing's sarcoma, a rare cancer that usually occurs in and around the bones. Mayo Clinic's child life specialists recommended Sara for the honor, which she was initially reluctant to say yes to. "She wondered, 'Why me?'" says Sara's mom, Deon Hove. "She wondered if there were other kids who would enjoy it. She puts other people before herself quite a bit." Including her mom. "The game was on Mother's Day, and Sara wondered if that's what I wanted to do that day," Deon says. "But after talking it through, she decided she'd like to go." So on May 8, Sara was there with front-row seats to what's been called (in this very publication) "the greatest show on hardwood." In addition to the meet-and-greet and golden (snack) tickets, Sara and the other Kids Captains received mini basketballs and team jerseys, which the coaches of both teams signed before tipoff. And while all of those gifts were appreciated, we think the best gift of all went to Sara's mom. "Sara kept getting more and more excited," Deon tells us. "It was so nice to see her out and happy. I don't know if I can put into words what that meant to me." (Happy Mother's Day indeed.) Sara had some words of her own after the game was over. "Thank you," she said. "For one day, I didn't feel sick." We call that a win, no matter what the scoreboard says. Score one with us by commenting below. Then, you can share this story with others using the social media tools atop this page.